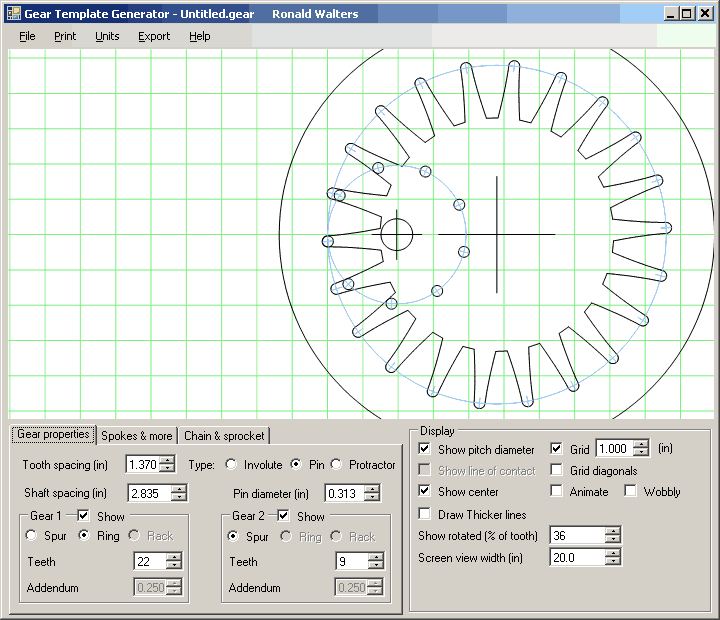 The Pin Gear Ring Gear is one of the gear forms available on Matthias's Gear Template Generator program and is under the Pin Gear or Lantern Gear setting. Pin size, spacing, shaft spacing and other variables are configurable for a variety of effects and combinations. 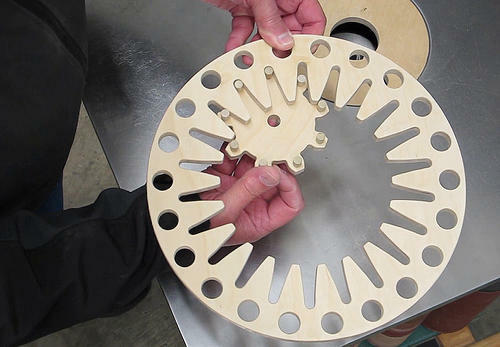 This particular ring gear is 11-3/4 inches outside diameter with 22 slots. 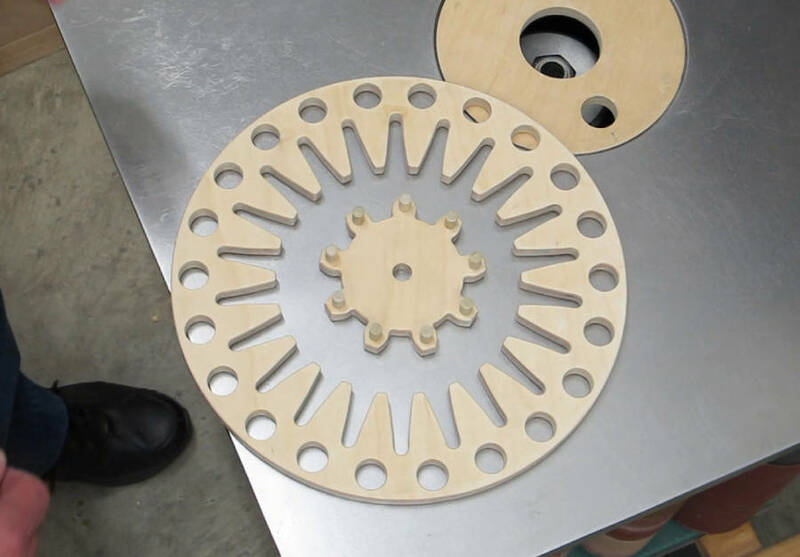 The pinion is 4-1/4 inch outside diameter with nine 5/16 inch dowel pins. 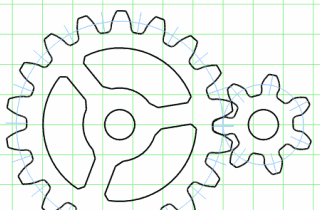 I made the pin gear pinion as a combination with a regular involute spur gear for future use. I placed the pin gear template on top of the involute gear template for this purpose. The critical dimension here is the shaft spacing, which determines the location of the driving pin in the slot(s). 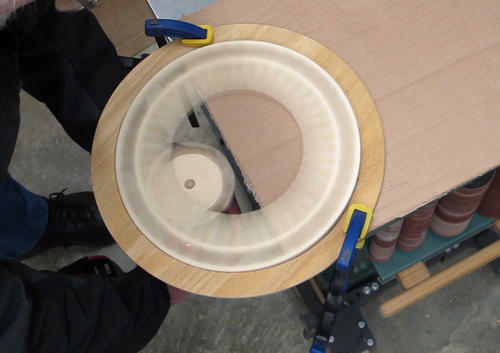 Careful sanding of the slots is required to fine-tune the slots so the pins enter and depart smoothly without binding. Maximum drill speed was 450 rpm spinning the ring gear 184 rpm (approximately 28 pin engagements per second). Very smooth! Why the holes around the circumference? 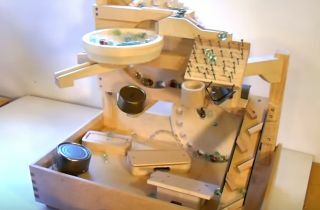 I first wanted to see how the pin ring gear worked and didn't want to waste plywood if I decided to go ahead with using it for a marble machine. Much easier to draw the circle for the holes for marbles while the center is still there.